Enjoy this photo of Lily and Josh with some of our children who attended Saturday evening’s inspiring event — so many that we couldn’t even fit them all on stage! Congratulations to Chinese Children Adoption International on 25 years of incredible service to the children of the world and the families who have been changed by them! I have personally witnessed Lily’s passion for child aid through her invaluable work on my Childcare Facilities Licensing Advisory Committee. Thank you, Joshua Zhong and Lily Nie, for your tireless work and passionate dedication to the abandoned children of China, Haiti, Latvia, Ukraine, Bulgaria, and the United States. Congratulations, again, CCAI. Cheers to 25 years and 12,000 children! 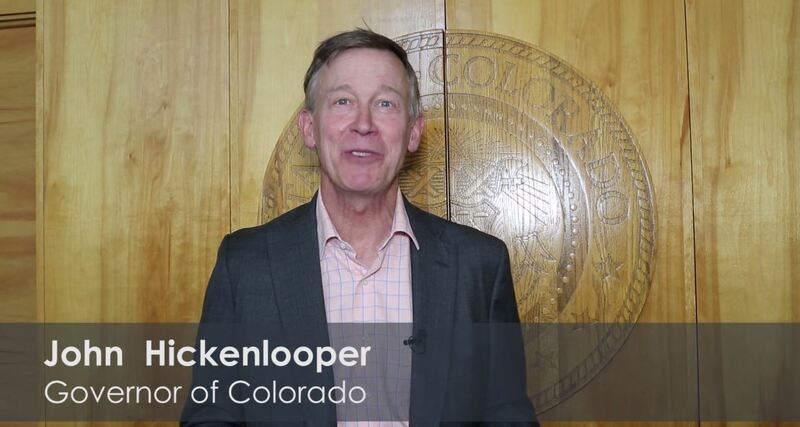 Colorado Governor John Hickenlooper shared a quick welcome message at CCAI’s 25th Anniversary Celebration at the Colorado Convention Center, Saturday night, September 16th. His welcome message preceded a reading of his gubernatorial proclamation by CCAI Chairman of the Board, Paul Rady, that established September 16, 2017 as, hereto forth, CCAI Day for the State of Colorado. The Governor’s proclamation can be read here. Centennial, Colorado, September 12, 2017: Chinese Children Adoption International (CCAI) is honored to announce Governor John Hickenlooper’s gubernatorial proclamation of “CCAI Day” on September 16, 2017. The Governor’s proclamation is heralding CCAI’s 25th Anniversary and its’ extraordinary placement of over 12,000 orphans, along with its’ incredible and unlikely journey to become the #1 ranked Chinese-focused adoption agency in the world via the amazing dedication, passion and leadership of Lily Nie and Joshua Zhong. On September 16, 2017, over 1,500 attendees will celebrate CCAI’s 25th Anniversary at the Colorado Convention Center, emceed by Colorado’s Aaron Harber (Broadcaster of the Year) and commemorate Lily Nie’s and Joshua Zhong’s lifelong work and legacy. From the most humble beginnings in Maoist China to touching the lives of over 75,000 orphans in China, Haiti, Ukraine, Latvia and Bulgaria via adoption and support programs, Joshua and Lily’s story is one of incredible achievement as well as a personal and business inspiration in and for Colorado. “I am honored that our life’s work and passion has made a difference in the lives of thousands of children, one child at a time. Our team at CCAI has an unparalleled commitment to help every child and family that we can reach and I am so thankful for their dedication and efforts,“ said Lily Nie, CEO and co-founder of CCAI and Colorado Women’s Hall of Fame inductee. Lily also spearheaded the creation of nine “Lily Orphan Care Centers” in China to improve and sustain the lives of Chinese orphans via specially trained staff and care, providing medical needs and using charitable donations to make the impossible, possible. “We started CCAI in our 200 square foot basement in 1992 and I had no idea we could or would come this far. Families are the essence of our society and every child deserves one; it has been an indescribable privilege for me to be part of this meaningful mission,” explained Joshua Zhong, President and co-founder of CCAI. “I am grateful for the opportunity and for our staff, our charitable donors, our families, and children who have made this milestone a reality.” Joshua also has been instrumental in establishing the Joyous Chinese Cultural Center in Colorado, providing post adoption services, creating the Adopteen program, and forging key China relations to facilitate the placement of over 12,000 orphans. Through their unwavering drive, unshakeable integrity and unparalleled work ethic to make a difference in the lives of thousands of children, Lily and Joshua have created an unprecedented movement that has positively — and indelibly — changed the trajectory of thousands and thousands of lives, both in Colorado and across the globe. CCAI Day on September 16, 2017, is a celebration of personal and professional achievement for all Coloradoans and people around the world. Founded by Joshua Zhong and Lily Nie in 1992, CCAI is a non-profit 501c3 charity recognized by the U.S. federal government, accredited by the Hague Accreditation, and licensed by the social service departments of Colorado, Florida, Georgia, Texas, Kentucky and Wyoming. CCAI exists to find loving and permanent home for abandoned children, to offer humanitarian assistance to orphans left behind, and to provide cultural and emotional support to adopted children and their families. For 25 years CCAI has been working with Chinese, Haitian, Ukraine, Latvia and Bulgaria governments and has found permanent home for over 12,300 orphans. CCAI is ranked the #1 China adoption agency in the world.